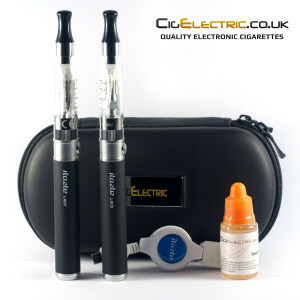 Thanks for purchasing the CigElectric PRO electronic cigarette starter kit! This guide will explain how to fill your starter kit once you receive it. It will also explain how to use and charge your battery, maintain your device and how to get the best performance out of it with some tips for usage. Please watch the videos, they may be the easiest method to learn how to fill your electronic cigarette. Filling your electronic cigarette is a relatively simple process. It is very important that the heating element in the device is saturated with liquid and not dry when you first use it. Otherwise this can lead to burning the wick and leaving a burnt taste in the device which is difficult to remove. Simply leave several minutes after filling for the wicks to soak up the liquid to avoid this happening. Your batteries come with around 50% charge. We recommend charging your battery to full before usage. 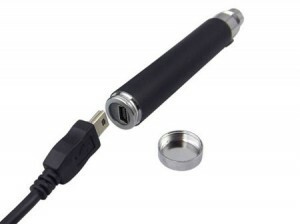 Once you have filled your device you can screw it onto the battery and it’s ready to go. Click the power button 3 times to unlock, the battery button will flash red, yellow then green. Press and hold the button on your battery to activate. Take a slow and steady draw on the mouthpiece for 3-5 seconds. The longer you draw the more vapour you will get and the stronger the throat hit will be. This may take a little practice but will become second nature and soon you will be producing large amounts of vapour and great throat hit. Pressing the button 3 times will lock / unlock the battery to avoid activating unintentionally. The battery has a 10 second automatic cut out for safety. The button on your battery has a remaining charge indicator while in use (not charging). Green means more than 50% remaining, yellow is less than 50% and red is below 20% remaining. We recommend charging your battery when below 20% (button glows red) to maximize the lifetime of your battery. When the battery is empty it will flash 5 times and no longer activate. Unscrew the silver bottom cap from the LEO Pro and plug in the mini USB. Connect your charger to any USB slot and allow several hours to charge. The LEO Pro battery can be used while charging once the battery indicator turns green (this does not indicate a full charge). Once fully charged the light on the LEO Pro button will turn off. Please Note: Electronic Cigarettes are electronic devices. Many electronic devices contain a battery which can potentially fail. The result can be potentially harmful, as certain types of batteries may expand or leak. Do not leave batteries charging while unattended or overnight. Only charge your battery with the correct charger purchased from CigElectric. Electronic cigarettes should be treated as any other delicate electronic device to avoid damage to the battery, other components, or harm to yourself. Electronic cigarettes should not be left inside a vehicle unattended or anywhere which may expose the battery to high temperatures. You should draw very slowly on the device unlike what you maybe used to with a real cigarette. Drawing too hard will cause excess liquid to be drawn into the atomizer and may cause leaking and a gurgling sound. To fix this issue remove from the battery and blow through the clearomizer mouthpiece onto some tissue to remove excess liquid. You should be careful not to over tighten the mouth piece when screwing back onto the clearomizer. This can loosen the threading and cause the mouth piece to not sit flush with the chrome ring at the top of the clearomizer. This can make the device not air tight and you may see vapour inside the tank. To fix this issue simply push the metal threading back up so it sits flush on the mouthpiece. We recommend wiping the connection points on your battery with tissue before charging. This will prevent build up and help keep your device clean and working great. You may notice a discolouration of the e-liquid inside the clearomizer after a lot of usage. Although this is not normally an issue you can clean the clearomizer as outlined below to resolve. After some time you may notice a reduction in vapour and performance. At this point you should replace the clearomizer head if the mouthpiece, tank and seals are still in good condition. Otherwise you can replace the whole clearomizer. Cleaning as outlined below can also extend their lifetime. Unscrew the plastic tank from the clearomizer metal base. Unscrew the clearomizer head and remove the rubber cap that sits over the coil and wicks. Rinse and/or soak in hot water until the wicks are clean. It is also possible to dry burn these clearomizers to extend their life time but you do so at your own risk as this can break the coil inside the atomizer head. Thank you for choosing CigElectric for your electronic cigarette starter kit. If you have any questions not covered in this guide please get in touch! Hi Barry, The Nautilus can produce more vapour but I would recommend it with a variable voltage battery to get the best performance out of it.